Atlanta-based Turnkey Engineering, Construction and Roofing (Turnkey) recently came to the rescue of one of the largest physicians in Atlanta when he experienced storm damage to the roof of his commercial building. 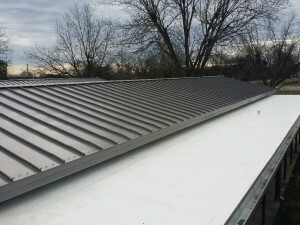 “When our business office’s roof was damaged in a storm, Turnkey came to our rescue,” said the doctor. “They walked us through the entire process from start to finish, including guiding us through the insurance process to ensure all of the work we needed was awarded in our claim,” he explained. “In the end, they provided us with a high quality roof and an even higher quality experience,” he added. Turnkey Vice President David Lewgood reports that the doctor and his team couldn’t say enough about Turnkey’s attention to detail. “This was a metal roof and the color was not quite what the doc expected in the end,” Lewgood reported. “Complete customer satisfaction is always our goal so we replaced the panels with a color that satisfied our customer,” Lewgood added. “We knew that Turnkey wasn’t going to consider our project complete until we were 100% satisfied,” the doctor commented. “We had chosen Turnkey for this project as a result of work the company did on two of our family’s rental homes,” he said. “And, based on the excellence they exhibited on those residential projects for us, we knew we would be happy with their work on our commercial building,” he added. Turnkey Engineering, Construction and Roofing is a woman-owned business headquartered in Atlanta, Georgia with a major office in Louisville, that provides engineering, construction and roofing services throughout the greater Atlanta ar ea. The team consists of professionals who have more than 50 years of experience in commercial and residential construction. Turnkey offers a comprehensive list of services from the simplest to the most complex of general contracting services within the residential and commercial markets. More information can be found at www.turnkeyga.com.